“Are you on the bottom? Can you feel the bottom?” Strange questions to be asked in a business environment, but not so strange once you realize they were being asked in a 16’ aluminum boat moving slowly on the Detroit River. 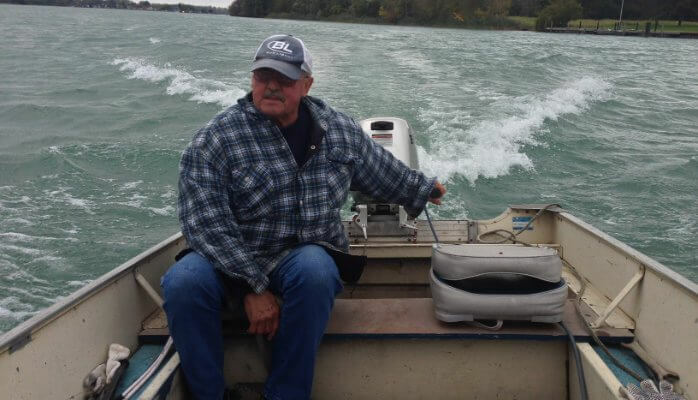 To a seasoned fisherman like my Dad who was steering the boat they were obvious questions – but to a two to three times a year fisherman like me – much less obvious. It is an oft-repeated phrase that when the student is ready, the teacher will appear. I don’t know if the student was actually ready on a Sunday morning in late July, but I got a lesson anyway. In fact – I got three. Seems obvious enough – doesn’t it? Fish, in particular pickerel - for which we were fishing - spend most of their lives within 2-3 feet of the bottom of the river. We were fishing in 25-35 feet of water with trolling reels and a set-up that consisted of a one pound sinker and two leads with five inch Rapella lures. The bottom lead was 20 foot long and the top lead was 40 foot. With your sinker positioned properly – your bottom lead will be 1 foot off the bottom, your top lead about 2.5 feet. In short, you are fishing where the fish live – but only if your sinker is on the bottom of the river. How hard can it be to find the bottom of the river? To a skilled fisherman like my Dad, it’s second nature. For me, it was a challenge. First, the boat is in constant motion. Second, waves from the prevailing north wind and other boats cause your boat to rise and fall. Third, the river bottom is not flat, and the water is deep enough that you can’t see the bottom. It’s not unlike the situation we face when trying to prospect for new business. We must prospect where the clients are – not where they aren’t – and we are playing in a constantly changing marketplace and in an economic climate where clients (like fish…) are cagey and don’t necessarily want to be caught. What our competitors are doing can affect our activities and while we strive to know as much as we can about our areas of expertise – there are things that we can’t see happening just below the surface. Ok, so I finally had that bottom thing all figured out, and I can consistently feel my sinker bouncing lightly along the bottom of the river. So, where are the fish Dad? Apparently finding the bottom is not enough – one must with a soft, gentle, flick of the wrist motion – pull the sinker up and off the bottom and let it back down. It’s this motion that causes your baits to swivel and dive, thus simulating the action of the small baitfish that your target – the pickerel – wants to eat. If there is no consistent action – your baits will drag along in the water, uninspired and unappealing. Are we engaged in consistent action – or do we think that just showing up should get us the clients and business that we want? Are we doing the little things that make the big difference to separate us from what our competition is doing or are our marketing and prospecting efforts dragging along uninspired and unappealing? How often are we engaging in that consistent action to attract new clients? Monthly? Weekly? Daily? We had caught two fish within the first 20 minutes – one each – but the next hour went by without any hint that fish were even there. While bobbing up and down on the river in the sunshine is a pleasant way to spend a day – the goal was fish. A friend of my Dad’s pulled up alongside and asked what lures we were using – and said that he was having success with a smaller more colourful lure. Less than 10 minutes later we had two more fish in the boat by using advice from someone who was having success doing what we wanted to do. Sometimes we (yes, I do it too…) stay stuck doing the same thing over and over again because it worked once and we can’t figure out why it doesn’t work now. That doesn’t mean that we throw it away and never revisit it – after all, my Dad probably has 200 different lures in his boat – of various styles, sizes, and colours. Why so many? Because what worked yesterday may not work today, and today’s hot bait won’t get you a bite tomorrow. If you only have one lure, it’s great when they are biting on it, but when they stop it can be a long, long time before you catch another fish. My goal for squeezing in a short visit to see my Dad during a business trip that was already way over-committed wasn’t to get a pep-talk about my business. It wasn’t to get lessons that would encourage me to rethink how was I was approaching my prospecting. The goal was to do a bit of fishing and hang out with my Dad. I’m pretty sure that he has no idea that our three hours on the river will affect how I look at my business over the next few months – but he will when he reads this post – thanks for the lessons Dad.